If you were called by a major record label for a recording session, would you know how much you should be paid? Would you be able to submit a report form to the label for payment? How about if you’re producing your own album – do you know what options exist to fit your budget? Do you know the differences between Limited Pressings and Demos? 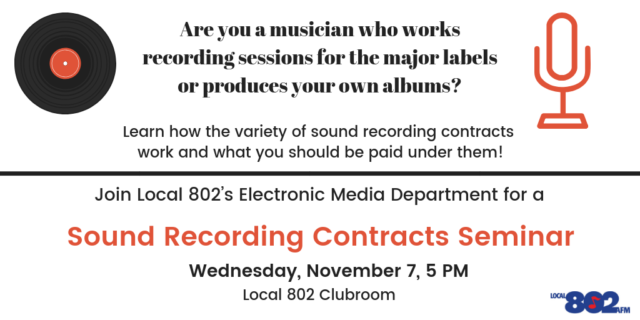 There’s a wide variety of options to sift through when it comes to “sound recordings.” If you want to make sense of it all, join Local 802’s Electronic Media Services Department on November 7th at 5 p.m. in the Local 802 Clubroom as we meet to discuss the AFM Sound Recording Labor Agreement and other related contracts. We will discuss topics such as wage and benefit calculations, filing of B-4, B-5, and B-9 report forms, low budget qualification, limited pressings, demos, Special Payments, and several other topics.